Rolled Your Ankle? Do you Go To Hospital? What To Do Next? We have written this detailed document so you can learn more about the anatomy, physiology, what we do to assess the area, what treatments are appropriate post injury, and most importantly, do you need an X-ray? Just fill in the details below and click download for your free copy! For any further questions, please contact us directly and one of our highly qualified physiotherapists will contact you. New Clinic Opening Near You! Catalyst Physiotherapy are pleased to announce a new location within the heart of Fleet. We will be working in close partnership with the Park Club Fleet, located on the first floor of the Hart shopping centre. This new and exciting move allows us to not use our expert physiotherapy skills such as massage, acupuncture, joint mobilisation and joint manipulations (clicking), but now we have an extensive array of equipment to get our clients back to your best! With our combination of Physiotherapists, covering all specialities and interests, we can provide expert analysis and treatment to a wide myriad of issues, from elite level sports to an achy lower back. Need to come and have a chat? Give us a call or email us and one of our expert clinicians will get in touch. Deadlifts Hurt? What do I do? Skip the deadlift? Squat instead? Lower the weight? Go home? We have written this document to provide you with new ways to keep lifting, stay strong and remain healthy! It explains and lists what we modify as physiotherapists, if someone was to present with pain upon deadlifting. . Outstanding opportunity for an experienced MSK and sports physiotherapist to fill a full time position and join our dynamic team in the beautiful county of Hampshire. Catalyst Physiotherapy has two well established private practices in Basingstoke and Hook. You will be taking over a previous physiotherapist's full time diary as well as growing from an existing client base, meaning there is an excellent opportunity for significant remuneration. Both clinics are located within fully equipped gyms, meaning we can, and do provide rehabilitation and treatment to all levels of clients. All of our physiotherapists receive a free gym membership. We take an integrated team approach to get the best results for our patients and we actively encourage regular CPD and onward development for all of our physiotherapists. You have over 3 year's experience, including working in private practice in the UK, excellent clinical reasoning, hand’s on and excellent rehab skills. Additional qualifications and skills in acupuncture/dry needling, clinical Pilates, running analysis, FMT, orthotics will be an advantage as well as experience with postnatal sports injuries in teenagers. You work well individually and are keen to grow and work alongside a great team. The practice is open from 7:00 am to 8:00 pm, the working rota will involve early and late shifts. At present we do not open Saturdays, but this may change if the candidate would prefer time off during the week. Interested? If you would like to apply for this opportunity, please send us your most recent copy of your CV to dfox@catalystphysio.com. We aim to respond to your application within 14 days of the closing date. We Have a New Physiotherapist and EX-INTERNATIONAL sprinter... Welcome Dawn! Here is a big welcome to our new Physiotherapist, Dawn. She is a huge asset and brings a wealth of experience to the team. Dawn has a vast array of experience within Physiotherapy, and being an ex-international sprinter sure helps! Dawn also completed a BSc (hons) in Sports Science before turning to Physiotherapy. Here is her bio, any aches and pains, keen runner, Dawn is your answer! We here at Catalyst Physiotherapy would like to welcome our newest member of staff, Hannah! Hannah is a highly rated Sports Massage Therapist who works in a variety of settings. Not only this, she competes as a fitness model! Read through her blog below, if you require an appointment, contact us today! Hi my name is Hannah and I am a fully qualified Sports Massage Therapist now working along side Catalyst Physiotherapy. I have a vast experience working in various disciplines from boxing clubs to competitive body building gyms. Whether you're training for an event or looking for muscular maintenance, sports massage can provide you with enhanced training ability as well as rehabilitation from injury. Having a sporting back ground myself through horse riding and female body building I have a great awareness of the impact muscular imbalances and tension can have on training, sleeping and day to day living. I am also a personal trainer which enables me to asses the origin of your ailments and help you resurrect the issues you may be experiencing issues with within your sport & discipline. I can help you build muscular strength in the areas you may be lacking so that you can progress further and get you one step closer to your goals. Anyone Ever Tell you They're Not Designed To Run... LIES!! Ever been interested in to how the human body has evolved to allow us to complete everyday tasks easily and efficiently? This video depicts perfectly the key points surrounding why we are designed to run. Big congratulations to a popular client at Catalyst Physiotherapy, Vicky. She smashed her target of 4:30 with a time of 4:10. .At least in the research for high level olympic lifters, deep squats appear not to be as dangerous as some may think, as discussed in a previous article. I don’t think this means that everyone needs to go ahead and start deep squatting. I am a keen supporter of the deep loaded squat for some people but believe there are a lot of other considerations from a knee health perspective to think about before embarking on a long career of squat personal bests and pain free knees. The major reason for this is the goal of getting the knee to track over top of the toes during the squat. I like to think of the patella as a train that rides along a train track known as the trochlear groove of the femur (picture). As we squat, if the knees aren’t directly over the toes we may be getting the train not tracking along the tracks and getting some abnormal wear of the patello-femoral joint. As discussed above, if we have some mobility issues, particularly in hip and tibial rotation as well as ankle dorsiflexion then we’re going to create a tracking issue. If you want to keep your knees healthy, this is a must! When it comes to proper patellar tracking along the trochlear groove we not only need to have adequate mobility, but also strength and stability. Stability issues of the core, hips, and foot can all lead to tracking issues at the knee, thereby increasing knee stress. 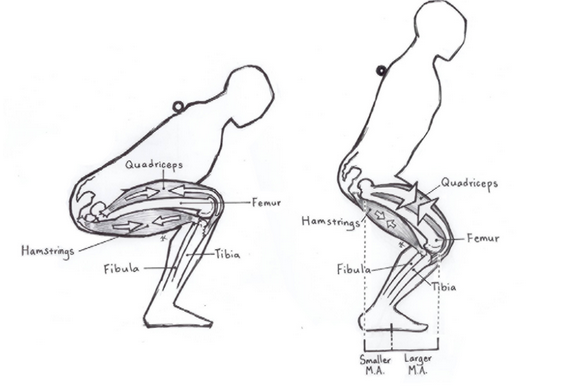 The further your knees come forward in the squat the greater the shear forces become in the knee. Having the knees back more in the squat will decrease these forces. However, pushing the knees back will increase shear forces on the spine. It’s a catch-22 that we’ll discuss more in depth another time. Faster lowering into the bottom of the squat and subsequent reversal of movement places more compressive and shear forces on the knee. Decreased speed into the bottom of the squat improves this stress. The quadriceps attach to the patella and have a direct relationship to both patellar tracking and controlling shear forces in the knee. As discussed above and in prior articles, the knee takes increasing posterior shear forces in the squat maximizing around 90 degrees and increasing with fast speed of execution into the bottom of the squat. A strong quadricep will help to buffer this and prevent as much stress on the knee. The quad exercisesI like to prescibe are lunge and split squat variations. While attempting to maximize quadriceps activity and prepare for the squat I like to keep the step relatively short to mimic the mechanics of upright squatting. Another favorite of mine is to elevate the front foot to increase knee flexion and more closely mimic the deep squat knee mechanics. These are also great for improving asymmetries from side to side. Having been reading more of the current research lately about volume management and injury I think that a lot of the principles apply to squatting as well. Squats need to be slowly incorporated into a comprehensive strength and conditioning program with adequate thought toward total knee stress throughout the training, week, month and year. Doing too much too soon without much thought toward the total program’s stress on the athlete can leave your athlete with sore and painful knees. FACT. On numerous occasions I have athletes or the general public who start having knee pain after starting a high volume olympic lifting program or after workouts with very high squat volume. Any sudden changes in training volume can cause issues. If you’re an athlete who needs to be able to handle high training volumes of squatting make sure you work your way slowly toward your goals. So the pattern overload concept. The concept is that if we are constantly wearing the body in a consistent way, then we are more susceptible to overuse injuries and degenerative changes in a predictive way. Finding the ideal squat stance for the individual is going to be incredibly important for health of not only the knees, but spine and hips as well. Vary the movement – Utilising more single leg variations like squats, lunges, split squats and step-ups can help minimise pattern overuse and break up the monotony of training. Hopefully this article shed some light on what should be in order to have someone squat proficiently and safely. The stress on the knee will be minimized if we take these factors into consideration. Need us? Contact us today! Should I Have Knee Meniscus Surgery? The meniscus is a natural shock absorber in the knee that provides some spring in your step and helps to protect cartilage. It can become torn with age or trauma, mopst commonly upon twisting of the knee, and greater than 90% of the surgeries on the structure are not repairs, as most patients believe, but are instead excisions, or cutting out, of the torn part of the meniscus. The big misconception that has been propagated like a “scandalous” rumor in a small town is that meniscus tears as seen on MRI after a middle-aged patient reports knee pain are significant. THEY ARE NOT. Just as many of your middle-aged friends who don’t have any knee pain or problems have meniscus tears; hence, the fact that your MRI has one is as important as those new wrinkles on your forehead in need of a little Botox. The first canary in the meniscus surgery coal mine happened way back in 2002, when a study by a Baylor College of Medicine orthopedic surgeon showed that debridement (the cleaning up of a knee that has arthritis and degenerative meniscus tears) was no better than a placebo. The procedure over the last 15 years has slowly slipped into medical oblivion. In 2012 a large high-level research study published in the New England Journal of Medicine showed that on average, patients who had meniscus surgery didn’t do any better than those who skipped the surgery and just had physical therapy. Many orthopedic surgeons criticized the study by saying that these patients had some arthritis and that there was still a justification for performing the procedure on patients with a meniscus tear without arthritis. That fantasy went “bye bye” in 2013 when a high-level study showed that meniscus surgery in patients without arthritis was no better than a fake surgical procedure. There was still one condition left where meniscus surgery might be helpful—a meniscus tear that was causing locking of the knee. However, a new study out this month just burst that bubble! The new study out of Finland looked at 146 patients who had “mechanical symptoms” (i.e., locking or catching thought to be caused by the meniscus). They randomized about one-half of the patients to meniscus surgery, and about half got a sham surgery. They found that the surgery provided no benefit to relieve knee catching or occasional locking, and they cautioned against patients getting the surgery. Now, I know surgeons will argue that there still may be a justification for the surgery in patients with severe frequent locking of the knee or in patients who are younger and have an acute meniscus tear. In the first instance, they may be right, and in the second, given that studies have shown a rapid onset of arthritis and increased forces on the cartilage after a meniscus surgery, I would caution that the circumstantial evidence is that surgery should be avoided in those patients too! In Summary there is little scientific justification at this point in patients 35 and older that operating on their torn meniscus will do any good, and it’s only a matter of time until insurers and national healthcare systems begin relegating this procedure to the dustbin of medical history. So if you’re asking yourself, “Should I have meniscus surgery?” answer yourself with a resounding “NO”!